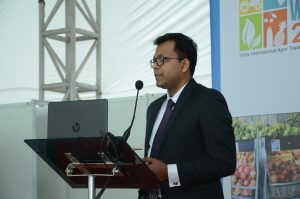 Indian Council of Food and Agriculture recently hosted the AgroWorld 2018 from October 25 to 27, 2018 in Delhi. There was a chapter on All India Agri Startups Convention & Agri Startup Awards 2018 to passionately promote and showcase to the world innovative startups emerging in agri & food sector of India. This was my talk at event in a session titled Agri Startups: Potential and National Perspective. I know this session is about agri startups in general but I want to focus on the part that I know – agritech startups. Now, why is agritech so critical for India? Because what my colleagues are trying to do in agritech, has never been done before. If the great telecom revolution put a 2g phone in the hands of a farmer, agritech aims to give them the controls of a drone and an IOT device. But before we talk about success, let’s start by talking about our failures. Millennium development goals. The world failed at MDGs. And, now, we have a second chance with SDGs. India is a signatory and we have a responsibility towards eradicating hunger, poverty and achieving sustainable development. Now, success of this program globally will be determined by the success of it in India. Because we have the most complex agricultural ecosystem as well as the largest number of poor in this country. But we also have one of the largest and most innovative IT ecosystems in the world. Agritech gives us a chance to use our biggest strength against one of our lasting weaknesses. Indian agritech can reverse a larger trend set by Indian IT industry. Even at this early stage, many Indian startups have already successfully explored markets in other countries. And, this is not work that travels offshore. In agritech, the shore is the offshore. And, that is why this sector has an impact that goes much beyond agriculture. When it comes to agritech, both the potential and challenges are global. How do we build more integrated knowledge networks? How does a startup here communicate with another in Brazil more effectively? How do we offer a startup the global perspective it needs without the costs and pains of a delegation? How can we share and learn from solutions and case studies elsewhere? How does the innovation cycle become more efficient because not everyone is trying to do their own thing? In this sector, we have seen potential competitors collaborate. Between the software and hardware, data, device and platform, numerous combinations to collaborate are possible and we should focus on speeding up the process. Coming to challenges, policy will remain one of the biggest challenges. For example, data localization. How does a small startup with a technology ready for a global rollout deal with such cost and regulatory complexities? I know of companies that have stayed out of countries because of this regulation. We need to find ways to iron out these issues. We, in the business world, have lived too long with this dualism. Be it a corporate or any other organization, we see anything with an impact on livelihoods as a CSR initiative. So, even today, when we talk to many companies, they will say let’s talk to the foundation guys. Now, that thought process hampers the growth of the agritech sector. Last few years, I have been asking people to think beyond profit and social initiatives and to think in terms of impact initiatives. All of us, including industry bodies and funders and policy makers, need to think of ways to monetize impact. I keep saying that in agritech, we cannot make the mistakes that we made in ecommerce. We can’t start chasing unicorns, we cannot talk in terms of GMVs. A sinking company in agritech will have a much bigger circle of disaster than an ecommerce one. But we still need to be able to talk about profits and turnover and exits. The answer is simple. We don’t need less or more. We need a different type of government for this sector to grow. We don’t need the government to distribute freebies, we need the government to turn the data that it is sitting on into a commodity. We thank the government for the speed with which the drone policy was framed. But we want equal responsiveness when it comes to procurement policies and data access policies. But then we don’t want the government just as a policy maker but we want the government to also be a consumer of these technologies. There are multi-lateral funds that are channeled via the central and state governments. Why can’t we have a clause that says 2% of such funds should be allocated towards new technology adoption? In India, agriculture is all the more complex because we are not dealing with one government but with each and every state government too. We need the government to act as a platform to enable partnerships, work on validations and exchange of technologies. Agritech is not just about introducing new technologies into agriculture. It is a whole new approach to each and every step in farming. That is why, we need to engage with all stakeholders and enable new ways in which they can contribute to sustainable and profitable farming. There are many agricultural universities in India which have excelled in innovation but are years away from incorporating IT technology in their outlook. Locked in their bellies are years of data and knowledge that is neither digitized nor accessible by the startup community. We need to find ways in which these traditional warehouses of knowledge and data are integrated into the innovation ecosystem. What about the traditional funders of agriculture? What about the United Nations or World Bank? How do we make them more aware of how technology is impacting agriculture? How do we convince them to make technology a part of their fund commitments? We need to work on knowledge exchange sessions where the development and technology sectors can come together and share issues and experiences. I hope next year, we will see a larger turn out of technology players at this event. We will, hopefully, see more conversations happening around agritech. When people ask me what’s NASSCOM doing in agriculture, I tell them that this is one bus no one can afford to miss. And, that goes for all of you here too.